Aamir Is Sorry for the Thugs Debacle! After getting a lot of criticism from fans and critics, Aamir Khan has finally spoken up about the debacle of his film 'Thugs of Hindostan'. This big budget, multi-starrer film was marketed as the most grand Bollywood film ever! But the film did not see even moderate success. After a good start on the first day, word-of-mouth reviews translated into a slump on the very second days. Many theatres took the film off after it witnessed empty seats for show after show. YRF probably expected to see success like Baahubali's, but the negative reviews stopped the film's take off to success very quickly. 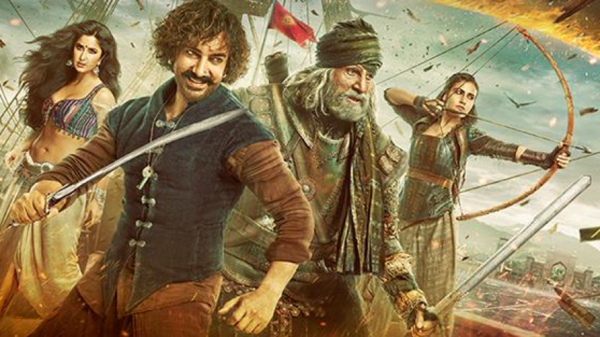 The biggest grouse Bollywood fans had with Thugs of Hindostan was blatant copying from Hollywood. Aamir Khan's character was uncannily similar to a well known Hollywood character. Nobody expects a blatantly copied film when Ammir Khan is associated with it! Aamir Khan has taken note of all this criticism and apologized to all his fans. Taking responsibility, Aamir said "I would like to take full responsibility for that. You can be sure that we tried our level best. There are people who have liked the film a lot and we would like to thank them. We are happy that they liked the film but that’s a minority. Majority of the people did not like the film and we are aware of the fact. So there is no doubt that we did go wrong. I want to apologise to the viewers who came to watch my film in the theatres as I was not able to entertain them despite trying my best. But those who came with so many expectations did not enjoy the film and I am feeling very bad about it." Amitabh Bachchan Made His Entry into 100 Crore Club With This Film! OMG -Aamir Shall Not Sign Any Bollywood Film for 10 Years! Meet Azad, Aamir's Baby Boy!